You like to think. You like mental activity. You like exercising the "muscles" of your brain, stretching them in multiple directions. This need for mental activity may be focused; for example, you may be trying to solve a problem or develop an idea or understand another person's feelings. The exact focus will depend on your other strengths. On the other hand, this mental activity may very well lack focus. The theme of Intellection does not dictate what you are thinking about; it simply describes that you like to think. You are the kind of person who enjoys your time alone because it is your time for musing and reflection. You are introspective. In a sense you are your own best companion, as you pose yourself questions and try out answers on yourself to see how they sound. This introspection may lead you to a slight sense of discontent as you compare what you are actually doing with all the thoughts and ideas that your mind conceives. Or this introspection may tend toward more pragmatic matters such as the events of the day or a conversation that you plan to have later. Wherever it leads you, this mental hum is one of the constants of your life. Consider beginning or continuing your studies in philosophy, literature, or psychology. You will always enjoy subject matter areas that stimulate your thinking. Thinking can be energizing for you, so schedule times for thinking. Use these times to muse and reflect. List your ideas in a log or a diary. These ideas will serve as grist for your mental mill, and might yield valuable insights. Take time to write. Writing might be the best way to crystallize and integrate your thoughts. Find people who like to talk about the same issues you do. Organize a discussion group that addresses subjects of interest to you. Deliberately build relationships with people you consider to be "big thinkers." Their example will inspire you to focus your own thinking. Explain to others why you need your time for introspection. Although it might seem to others that you aren't doing anything, introspection allows you to refine your ideas; thus, for you it is productive behavior. Allow others time to think through your new idea after you have presented it for the first time. Realize that they might not immediately understand this new idea because they have not spent as much time as you have pondering it. 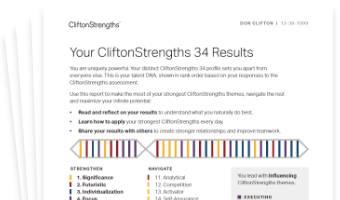 See how Intellection shows in your CliftonStrengths results -- discover All 34 CliftonStrengths Themes today!